Dismounted Close Combat Sensors (DCCS) will improve navigation, automatically detect threats and share this information with other soldiers and commanders in previously GPS-denied environments. The sensors could also help prevent ‘blue-on-‘blue friendly fire incidents. On operations, commanders can monitor their troops’ location using GPS and for those on the ground it provides much greater situational awareness. But warfare in an urban environment poses real problems – the signal is lost. The UK’s Defence Science and Technology Laboratory (Dstl),working with industry partners, Roke Manor Research, QinetiQ and Systems Engineering and Assessment (SEA), believes it has the solution to overcome the problem of ‘No GPS signal’ when entering buildings, when there is no clear line of sight with the GPS satellites or if the signal is being jammed. The DCCS system uses inertial and visual navigation sensors when GPS signals are not available. Taking the last known GPS location, DCCS combines information from visually tracked features captured by a helmet camera and inertial sensors, accurately calculating where an individual is, allowing people to be tracked in buildings and tunnels. DCCS can also help to prevent so-called ‘blue on blue’ incidents where friendly forces are mistaken for the enemy. The system allows commanders to track not only the location of personnel, but GPS, inertial and magnetic sensors on the weapon also accurately track where it is pointing. Reliable knowledge of both the location and the weapons direction instantly identifies if friendly troops are being targeted. 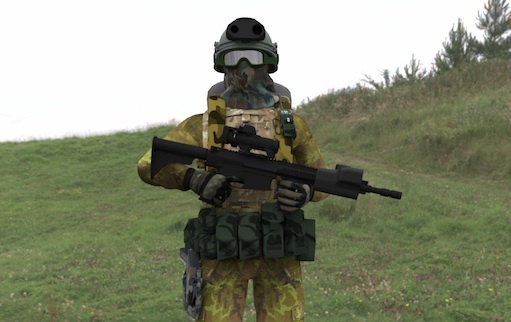 A combination of camera, laser and orientation sensors mounted on the personal weapon will allow them to highlight targets to other troops, unmanned aerial vehicles and aircraft at the press of a button. This will be quicker, easier and less confusing than giving verbal instructions; it is also extremely accurate. The system has many other uses such as identifying wounded colleagues, the location of civilians and potential helicopter landing sites.In addition, acoustic and camera technology automatically identifies where enemy weapons are being fired from, even if the individual hasn’t seen or heard it being discharged. This information is provided to the wearer and to commanders, allowing them to take appropriate steps to deal with the threat. The navigation and tracking system has a wide range of non-military applications. For example, it could be used on autonomous cars, to monitor emergency services when entering buildings or to track mine rescue workers underground. DCCS is expected to go into service in the 2020s.